The Tasmanian Planning Commission (TPC) has just released the TWWHA Managememt Plan 2014: Director Report and Representations. With UNESCO emphatically ruling out it out the issue of logging special timbers in the TWWHA is now dead and buried (at least until the next management plan review). Timber Harvesting is discussed on pages 11-12 of the TPC report. However the TPC is clearly confused. It interpreted my representation as supporting special timbers logging in the World Heritage Area!! Ok! Maybe I didn’t explicitly say NO! Maybe I was too analytic and not emphatic enough. In no way do I agree that the Draft Plan “allow[ed] the management of Tasmania’s unique special species timber for sustainable production within legislated categories of reserves …[whilst] not compromising the Outstanding Universal Values for the TWWHA”. I do NOT support any special timbers harvesting in the TWWHA!! I just wanted to clear that up and leave no doubt in anyone’s mind. I just found this article in The Australian from 10th October 2015 by the Tasmania correspondent Matthew Denholm. Oh the sad stories of taxpayer-funded cultural and family heritage. It’s enough to make one weep with sympathy. But as a forester after watching this fiasco for 35 years these stories don’t work for me anymore. My sympathy was consumed in the forestry wars of the last 20 years, and the ongoing blatant politicisation of the forest industry in Tasmania. Forestry is just about wedging the community and winning elections – nothing more. Now I’ve had enough of the sob stories. In fact I feel deeply offended by this ongoing stupidity. The public native forest special timbers industry has never been and never will be sustainable nor profitable. And all the fine craftsmanship and beauty in the world will not make it so. This is not a Tony Abbott moment revisited! Good [special timbers] forestry does not start tomorrow, nor any other day. The past 30 years have clearly demonstrated that good, profitable public native forestry will never happen in this State. Most special timber craftsmen lay much of blame for the emerging crisis on the politicians and timber barons who presided over a forestry industry that “wasted” vast volumes of special timbers in a head-long rush to clear old-growth forests. Excuse me!! Ever since I can remember the special timbers industry has pretty much universally supported the industrial forestry orthodoxy and State Government policy, including the 1996 Tasmanian Regional Forestry Agreement. They didn’t really have any choice in the matter. All the forest policy was made for the big boys. The cheap subsidized wood provided by large scale industrial forestry is exactly what allowed the special timbers industry to thrive over the past 40 years. So to turn around now and blame the politicians and greenies is disingenuous in the extreme. …until the politicians squandered it! The politicians did indeed squander it [our public native forest resource] and the vast majority of Tasmanians including the special timbers industry were right there in full support. Millions of tonnes of special timbers burnt and chipped over the last 40 years. And now it’s time for tears and regrets? Find someone else to blame? Don’t take any personal responsibility? No! It’s now game over!! No sympathy! No excuses! No exceptions! No Tony-Abbott promises of “good forestry tomorrow”!! What little remains of our precious old growth and rainforest must not be used for further political games, waste, and stupidity. However, Paul Harriss faces stiff resistance from many of the craftsmen in whose name he is -acting. They might be united in condemnation of previous “waste” of their resource, but they are divided when it comes to securing new ¬supplies from within the TWWHA. The community reaction would rival if not exceed the Franklin Dam blockade. The damage done to Tasmania’s reputation, as a recalcitrant belligerent State would take decades to heal. Brand Tasmania would be completely trashed!! Whichever way the issue plays out, the special timbers and traditional skills that shaped a state are in ¬danger of being consigned to its past. It’s the usual dramatic scaremongering that the mainstream media loves to peddle. 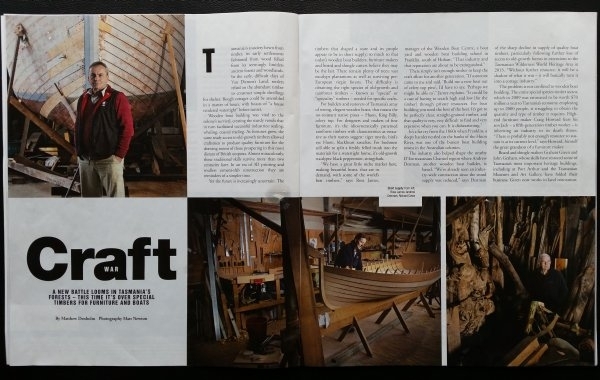 This article did not cover anything like half the real story of the special timbers industry. It just repeated what has been repeated many times before. There are many aspects of the story that were completely ignored. The special timbers and the skills will not be consigned to the history books and museums. They will be confronted with reality just like the ivory traders and whalers were. Those that choose too can adapt and change to the new reality. Those that choose not to change will no doubt chew their old bones for comfort. My own proposal to develop the commercial potential of growing blackwood timber via a blackwood growers cooperative is just one of the many special timbers opportunities waiting to be developed. But it’s not likely to happen whilst the old wars and the old warriors continue to play their games. State opposition leader Bryan Green today announced a policy for Tasmania’s special timber industry, supporting logging within the Tasmanian Wilderness World Heritage Area (TWWHA). After a brief hiatus the Labor and Liberal parties are once again in lock-step on forest industry policy in Tasmania. Once again forest industry policy in Tasmania is driven by politics, waste and community conflict. The politicians want us to believe that special timbers is only about fairy land, a magic wand and elvish forest management. There is no mention of UNESCO, the World Heritage Committee, Forest Stewardship Council, taxpayer subsidies, sacking teachers and nurses, or the last 30 years of politics, waste and community conflict. Nor is there mention of private blackwood growers. Instead our politicians will wave the elvish wand and middle earth will magically appear. It’s just rubbish and deception. Forestry is not a taxpayer-funded community service! Nor is this middle earth! Last month, UNESCO’s World Heritage Committee urged the Australian and Tasmanian governments to ban commercial logging within the TWWHA. So in good old fashion style our State politicians are once again joining forces to wage war over our forests. The Tasmanian community will once again be the losers. With classic political vote winners like “long-term security”, “consultation” and “striking an appropriate balance” we have heard it all dozens of times before. Absolutely nothing has changed for our pollies. Except now a lot more Tasmanians are sick and tired of the conflict and nonsense around the forest industry. Not to mention squandering $millions of taxpayer dollars and sacking teachers and nurses, and charging electricity users to help subsidise the forest industry. A lot more Tasmanians will express extreme displeasure if this nonsense continues. Specialty timber groups believe they were left with an extremely restricted resource after the Tasmanian Forest Agreement was finalised in 2013 and new tracts of forests were declared off-limits. The agreement was repealed by the current Tasmanian Government in 2014. What absolute rubbish! So called specialty timber groups were left without a (public native forest) resource because of 30+ years of failed forest industry policy; a policy that tied the industry to the election cycle and gave everything to industrial woodchipping leaving nothing but platitudes and tears for the specialty timber groups. I must say after listening to this sort of rubbish for 30+ years I’m getting pretty sick of it. The culture of entitlement within the forest industry that former Gunns CEO Greg L’Estrange mentioned recently is certainly prevalent within sections of the special timbers industry. The forestry wars are well and truly heating up once again. Stand by for the media/community backlash. The special timbers industry is on a hiding to nothing. When will Tasmanian get a fully commercial and profitable forest industry? 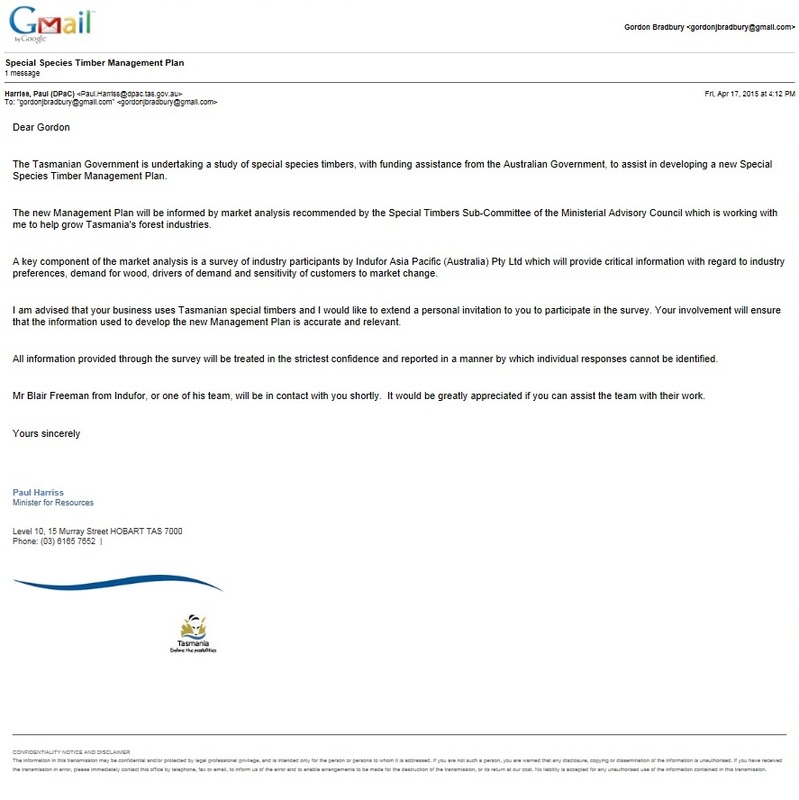 This email arrived in my inbox on Friday from Minister for Resources Paul Harriss. This may be interesting. Or else it will be the same old stuff we’ve seen before – or worse!! I am not holding out much hope. But I do pity the poor consultants who sign up for these jobs. Imagine helping to justify logging the Tasmanian Wilderness World Heritage Area at taxpayers’ expense whilst we are sacking teachers and nurses. How on earth do you keep any sort of professional integrity or reputation in all of that? I’m looking forward to having a discussion with “Mr Blair Freeman or one of his team”. I wonder if they understand that forestry is a business not a division of Centrelink Australia? This management plan is not due to be completed/released before 2017 in time for the next State election. One thing is absolutely guaranteed. This management plan will not contain any discussion of commercial issues. Nor will it consider the possibility of Tasmanian farmers growing special timbers. The idea that Tasmanian farmers are already growing and harvesting special timbers, and would likely grow more if given the right market signals, will be completely ignored in this management plan. The fundamental assumption will be that special timbers can only come from taxpayer-subsidised Tasmanian public native forests. In other words it will not be a business plan but a glossy political/marketing document, like the 2010 Special Timbers Strategy. I shall keep you informed as this proceeds.